The NIT it is. Unfortunately, the Alabama men's basketball team (18-15, KenPom: 59, NET: 59) did not receive a bid to the 2019 NCAA Tournament, but will have the opportunity to continue playing. The Tide are a 1 seed in the NIT, and will host the Norfolk State Spartans (21-13, KenPom: 264, NET: 260) in Coleman Coliseum on Wednesday night. Game time is 6 P.M. CT. The game will be televised on ESPNU. Something to keep in mind: The NIT will once again have experimental rules in place. These include an extended 3-point line (the FIBA distance of 22 ft, 1.75 inches), the free throw lane will be widened from 12 ft to 16 ft, the shot clock will reset to 20 seconds after an offensive rebound instead of 30 seconds, team fouls will reset at the 10-minute mark of each half and one-and-one free throws will be eliminated (teams will shoot two free throws after the fifth team foul in each 10-minute segment). If a game should go into overtime, team fouls will reset, and the teams will shoot two free throws at the fourth team foul or the second team foul that is committed with under two minutes remaining if the foul comes before the fourth team foul of the overtime period. While I love all of the rules being implemented for the NIT because I think all of them improve pace of play, this overtime rule is a bit much. Anyway, on with the preview. My Two Cents: Alabama lost three one-possession games this season. If they win just one of those games (Georgia State, Texas A&M, at Tennessee), they're likely preparing for an NCAA Tournament game this week. Sometimes a season comes down to one game or one possession, and it's the inattention to small details that this team struggled with all season that ultimately cost it a shot at a second consecutive NCAA bid. As with any team in the NIT bracket, Alabama must decide by Wednesday night if it's going to put the requisite amount of focus and energy into extending its season or just go through the motions. They say the first game in this event is the toughest for teams from a psychological standpoint so it will be interesting to see how this team comes out on Wednesday night. 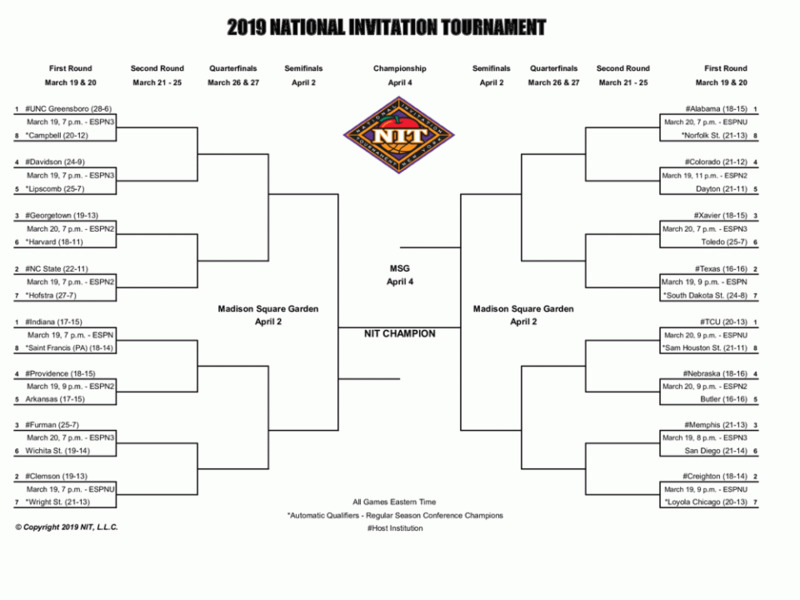 In its previous two NIT appearances, Alabama lost in the first round both times. For what it's worth, the last time Alabama was a 1 seed in the NIT (2011), they advanced all the way to the title game. I understand the disappointment that the players and coaches must be feeling, but I hope they'll come together to try and extend this season. I understand the disappointment that the fans are feeling, but I hope, if you can make it out to the game, you will. There are a group of seniors on this team that have been good representatives for the university, and it would be awesome to see fans turn out to support those guys, regardless of your feelings for the coaching staff. At the end of the day, as fans, our main priority should be supporting the student athletes that made a commitment to this program that we love so much. 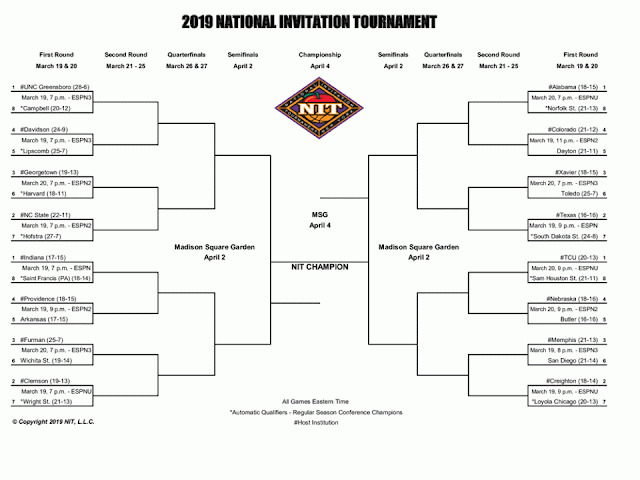 Norfolk State earned an automatic bid to the NIT by virtue of winning their league's regular season title, but fell in the championship of their league tournament. The MEAC was ranked last (32) in KenPom's conference rankings this season so first glance would lead an Alabama fan to think that our guys should have a talent advantage in this one, in addition to the homecourt advantage. But this tournament is hard to predict because it's impossible to know which teams will show up emotionally after failing to reach the NCAA Tournament. Unlike the NCAA Tournament where upsets of the top seeds are rare, the NIT has had its share of 8 seeds upsetting 1 seeds in recent years (a 1 seed has lost to an 8 seed in two of the last three seasons). Norfolk State's strengths on the offensive end are 3-point shooting (37.3%, which is 44th in the country), they have a high free throw rate (31st in the country) and they make 72.2% at the line once they get there. Making three-point shots and getting to the free throw line will always keep you close in games, even if the other team has a talent advantage. On defense, the Spartans do a good job of limiting easy looks from 2-pt range (47.7%, which is 69th in the country), and one of the primary reasons for that is they are a very good shot-blocking team (41st in the country in block pct at 12.3%). These numbers suggest that it won't be a layup party for Alabama. In addition, Norfolk State is a top 60 team in defensive turnover pct (20.8%), which is certainly concerning for us when you consider Alabama's turnover issues. One silver lining is that while their opponents do average a high turnover rate, Norfolk State's steal pct is rather low (7.8%, which ranks 269th) which suggests they struggle to generate live-ball turnovers. Opponents that can generate live-ball turnovers have been like kryptonite for Alabama this season so that provides some comfort. Norfolk State's weaknesses on the offensive end have been a high turnover rate of their own (20.6%, which ranks 301st in the country), but Alabama has been ghastly this season in forcing turnovers (17%, which ranks 271st in the country) so it would seem that, once again, the turnover rate for both teams will be a key statistic in an Alabama game. Norfolk also struggles to score in the 2-pt area of the floor, making only 46.9% of their attempts, which is 293rd in the country. A reason for these struggles may be due to the fact that no player on Norfolk State's starting lineup is listed as over 6'6 and no players in the rotation over 6'8. This may also account for why the Spartans struggle on the glass on both offense (ranked 231st) and defense (208th). Alabama should have a significant advantage on the glass. Norfolk State will also foul you. Their defensive free throw rate is 43.4%, which ranks 342nd in the country so if Alabama is aggressive on offense, chances are they will get to the free throw line. Players to Watch: The Alabama team. The key to making a run in the NIT is having the right mindset, and quickly overcoming the disappointment of missing the NCAA Tournament. Teams with the right motivational leadership from players and coaches is key. Unfortunately, that's been a huge issue for the team this season and, some would argue, for the last four years. The hope is they buy in, play for each other, and extend the season. If this team is playing in Madison Square Garden in a few weeks, it will at least salvage some of this season. When Norfolk takes the floor on Wednesday night, they will likely start four guards. All four average double figures or just under with the best appearing to be Nic Thomas. The 6'2, 185 lb junior is averaging 14.4 pts, 3.1 rebs, 1.7 asts, and is knocking down 39.8% of his 3-point shots. Prediction: Alabama will likely be the favorite in a game for the first time in seven games. They have the home court and talent advantage in this one. Beating Norfolk State alone won't send much of a message where it concerns the mindset of this team, but how they win the game might. Alabama arguably has the toughest path to Madison Square Garden of any top seed in this bracket with established programs (Texas, Xavier and Dayton), and tough mid-major programs (Toledo, South Dakota State). In order to navigate the path, they're going to have to do something that they've struggled to do all season and that's play smart, focused basketball for forty minutes in multiple games. First things first: take care of business in this one.